15 Sagittae is located about 57.6 light-years from Sol. 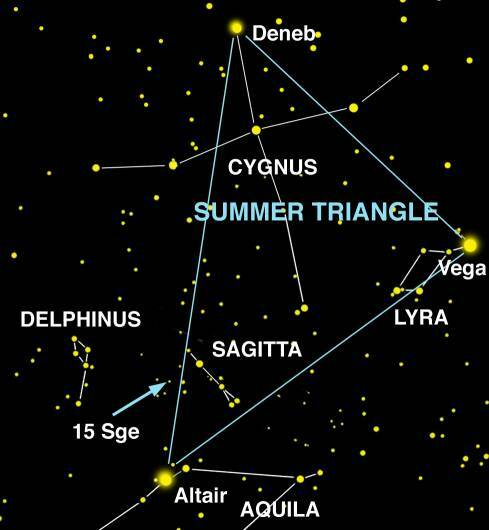 It lies in the southeastern corner (20:4:6.2+17:4:12.6, ICRS 2000.0) of Constellation Sagitta, the Arrow -- south of Gamma Sagittae, northwest of Rho Delphini, and northeast of Altair (just outside the Summer Triangle). 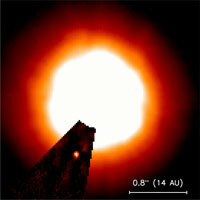 On January 7, 2002, astronomers announced the discovery of a brown dwarf companion to this Sol-type star using direct imaging (see press release and graphics), whose mass and orbit were subsequently refined with 24 years of radial-velocity observations -- Crepp et al, 2012, with more details below). 15 Sagittae (Sge) is a yellow-orange main sequence dwarf star of spectral and luminosity type G0-1 V (Crepp et al, 2012). The star appears to have 1.08 +/- 0.04 times Sol's mass, 1.115 +/- 0.021 times its diameter, and 1.338 +/- 0.032 times its luminosity. With a metallicity around 1.12 Sol's and higher chromospheric activity than Sol the star appears to be 2.5 +/-1.8 billion years old -- probably younger than Sol's 4.6 billion years (press release), and one analysis of isochrones suggests that the star may only be 2.0 billion years old (Crepp et al, 2012); and Guinan et al, 1999). The SIMBAD Astronomical Database identifies 15 Sge as a variable star, and it has been given the New Suspected Variable designation NSV 12757. The star has as many as four visual companions that are not bound to it. Useful catalogue numbers and designations for the star include: 15 Sge, HR 7672, Gl 779, Hip 98819, HD 190406, BD+16 4121, SAO 105635, LHS 3515, LTT 15872, LFT 1517, and Wolf 866. On January 7, 2002, a team of astronomers (including Michael Liu, Debra Fischer, James Graham, James Lloyd, Geoff Marcy, and R. Paul Butler) announced the discovery of a brown dwarf companion "b" to 15 Sge by direct imaging, at the 199th Meeting of the American Astronomical Society in Washington, DC (Liu et al, 2002; in pdf; and press release and graphics). Hints of this massive substellar object were first detected in high-precision radial velocity data gathered as much as a decade ago from Lick Observatory on Mount Hamilton in Califonia. In June 2001, Liu took high-resolution pictures of 15 Sge using the University of Hawaii's QUIRC camera and Hoku'pa'a adaptive optics (AO) system on the 8.1-meter Gemini North telescope, followed by second and third epoch imaging with the Keck AO system in August and December 2001. With a half year's worth of images, the astronomers determined that the star and the object moved together through the sky with the high common proper motion exhibited by nearby objects in the Solar neighborhood, confirming that the two are physically associated. Spectrum analysis indicated that the companion object had the cool surface temperature characteristic of brown dwarfs (type L 4.5 +/- 1.5). 15 Sge b has 55 to 78 times Jupiter's mass. Based on observations through early 2012 and theoretical models of the cooling of very low mass objects, 15 Sge b is estimated to have around 68.7 +2.4/-3.1 Jupiter-masses (Crepp et al, 2012). Thus, its mass equals dozens of times the total mass of all planets in the Solar System. 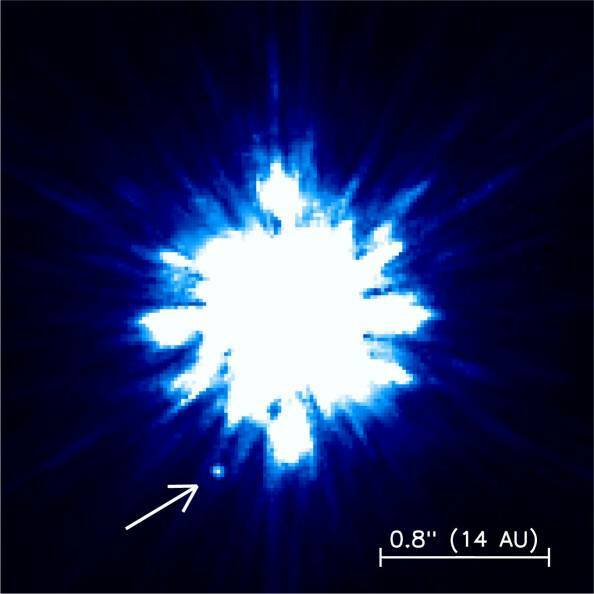 As a result, astronomers believe that it may be too massive to have formed like a planet from the circumstellar disk of gas and dust that enveloped 15 Sge when it was less than a hundred million years old. Rather, it may have developed from a fragment of the molecular cloud that was condensing into 15 Sge itself at an earlier stage of stellar formation. 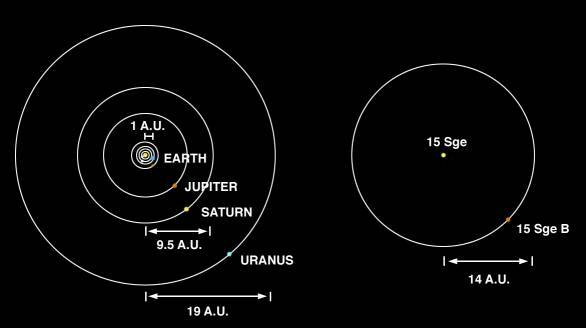 times greater than Saturn's orbital distance in the Solar System. Given its high mass of 68.7 times that of Jupiter, the brown dwarf moves around 15 Sge at an average orbital distance (mean semi-axis) of only about 18.3 +0.4/-0.5 AUs (a little short of the orbital distance and Uranus in the Solar System). The brown dwarf has a near edge-on orbital inclination of around 97.3 +0.4/-0.3 degrees from the perspective of an observer on Earth, a period of around 73.3 years (Liu et al, 2002; in pdf; and Crepp et al, 2012). Past radial velocity analysis suggests that giant planets of one tenth to 10 times the mass of Jupiter do not exist within 0.1 to four AUs of 15 Sge (Cummings et al, 1999). Moreover, the brown dwarf companion to 15 Sge may eventually prove to have a highly circular orbit that is coplanar with the circumstellar disk so that planets formed in inner orbits around the star. If so, then conditions would be more favorable for the existence of stable orbit for an Earth-like planet (with liquid water) centered around 1.15 AU from around 15 Sge -- between the orbital distances of Earth and Mars in the Solar System. Assuming that 15 Sge has a mass equal to Sol's, then such a planet would have an orbital period of about 450 days, or just over 1.2 years. Astronomers would find it very difficult to detect an Earth-sized planet around this star using present methods. The following table includes all star systems known to be located within 10 light-years (ly), plus more bright stars within 10 to 20 ly, of 15 Sagittae. The late John Whatmough developed illustrated web pages on this system in Extrasolar Visions. Up-to-date technical summaries on these stars can be found at: the Astronomiches Rechen-Institut at Heidelberg's ARICNS, and the Nearby Stars Database. Additional information may be available at Roger Wilcox's Internet Stellar Database. The third smallest constellation in Earth's night skies, Sagitta lies south of Constellation Vulpecula (the Fox) and north of Constellation Aquila (the Eagle). 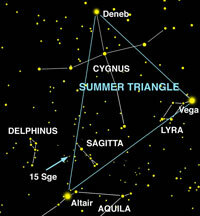 Its stars form the shape of an arrow flying towards Constellation Cygnus (the Swan). Sagitta has no stars brighter than fourth magnitude and none that is named. For more information about the stars and objects in this constellation and an illustration, go to Christine Kronberg's Sagitta. For another illustration, see David Haworth's Sagitta. Note: Thanks to Andrew James for notifying us of updated mass and orbit information for the brown dwarf companion to this star.